Valentine’s is almost here and I realized I hadn’t even decorated yet!!! So, I went to go get all my decorations and… I have nothing!! I had a wreath and a door mat. So I thought this would be the perfect time to make some!! I have this cute mint green mirror on my mantel so I wanted to be able to work around that. I picked a color scheme of rose pink, white, gold, and mint. 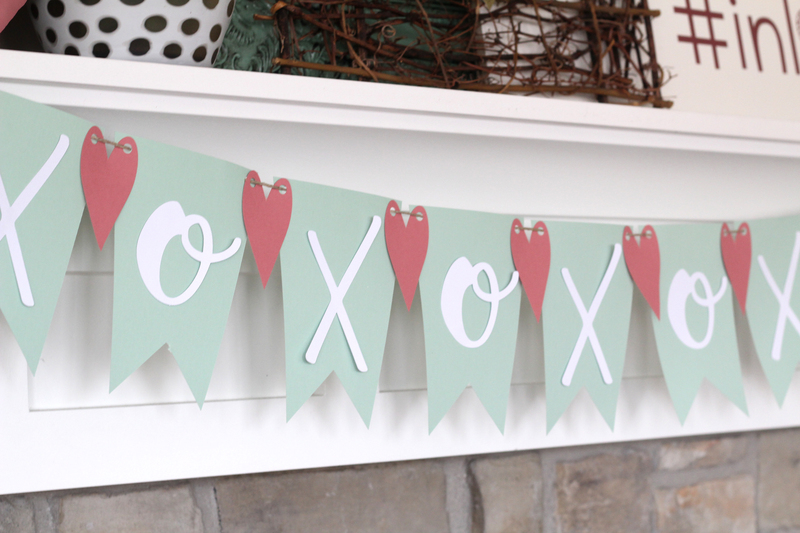 You can create so many DIY projects with the Cricut Explore Air 2! From home decor, paper crafting, making shirts and personalizing clothes, party decor, paper crafts ect.. 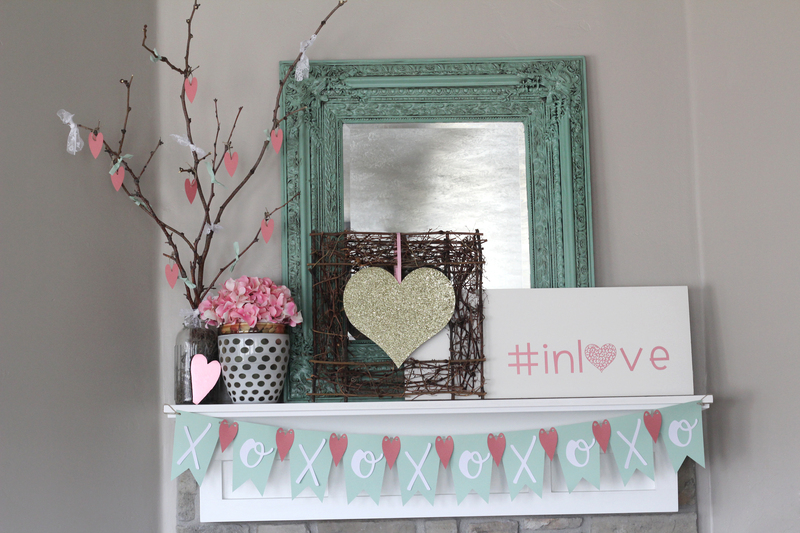 I did 3 separate DIY projects for this Valentine’s mantel. 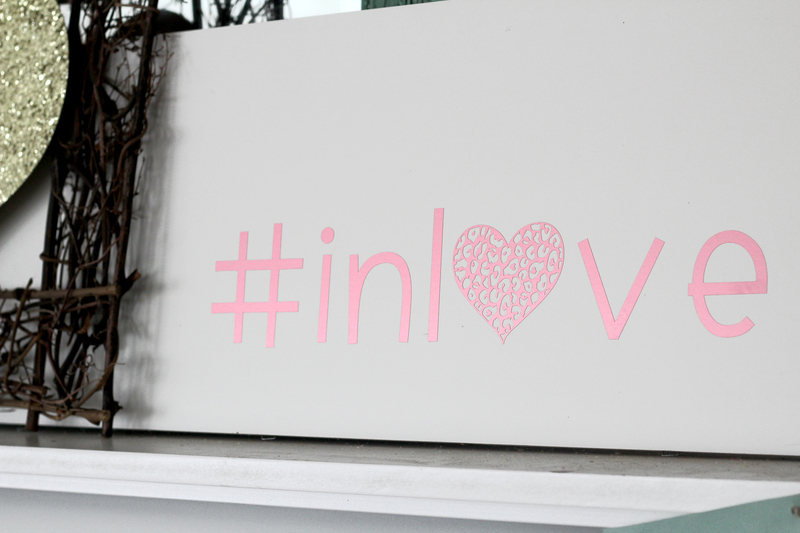 First lets start with the #inlove sign. Insert text into a new project. 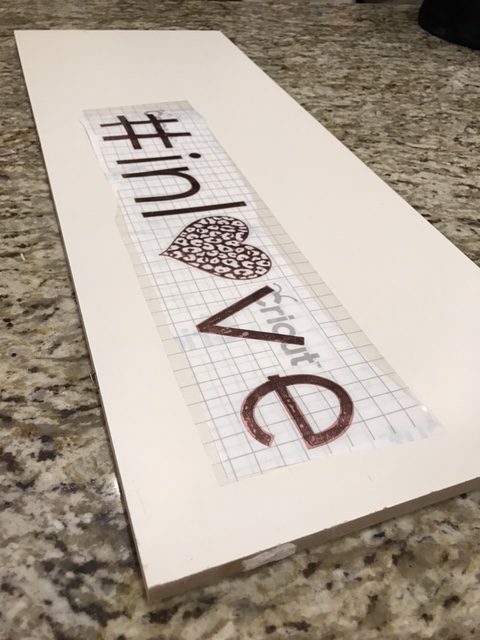 Type the words #inl ve leaving a space for the heart in place of the o. I used the simply sweet font. Search for hearts, and scroll through to find the leopard heart. Insert and adjust to the size to fit in the space. Select the entire saying now and group all the letters and heart together. This way you will be able to resize the whole image now as one. I made mine just short of 17″ long. Click go. You will need to use the 12×24 cutting mat since this image is about 17″ long. I used the Cricut adhesive, rose colored, vinyl for this image. After the image has cut. Weed out all the negative image that oyu dont want and then cut a piece of transfer tape to fit and apply it. Prepare your 10×24 Board however you want i just went with a white finish. place where you want it to be and attach it. Lets make the Banner next. Measure your mantel so you know the width that you will need to cover. 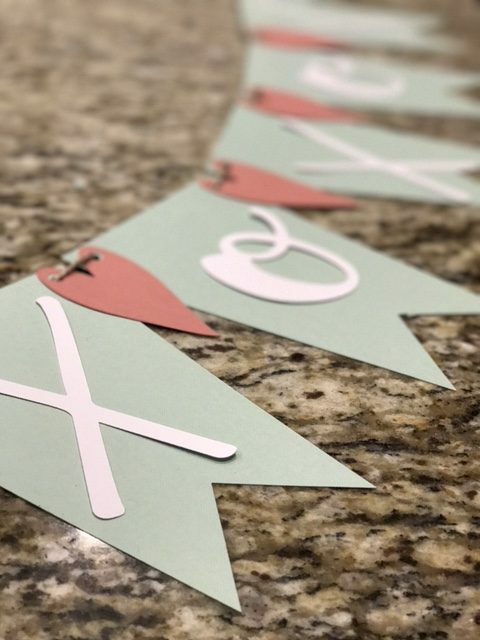 You will need to search in Cricut Design Space for pennants. Figure out the size that you need. I did mine 5″ wide and I needed 10 of them. Find this one that goes smaller at the bottom. Insert a shape. Select the heart. Click the lock on the bottom left to unlock the dimensions. This will allow you to change the shape of it . Pull it in, so it skinner and down, so it’s longer. When you get it to the shape you want, click the lock again so you can adjust the size that you will need. So I want to teach you how to slice a holes out of it so you wont have to use a hole punch. After you have created your image, add a circle image to the page. Adjust it to the size you want the holes and place it where you want the holes to be. 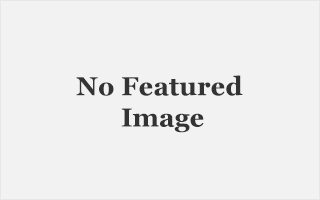 Select both the image and the circles, click the slice button on the top right menu bar. Drag the heart to the right and you will see that is now has the holes sliced out. Delete the little circles that are left over and copy it 9 times. Add the text. You will need, 5 x’s I used the Hedi Swap Lettering. You will need 5 o’s I used the Lipstick Lettering. Once you have all the parts created, line them up and make sure the sizes all look good. Click Go and follow prompts for color changes. 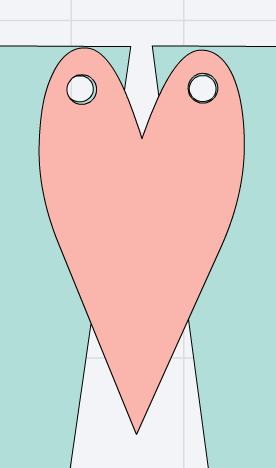 Pennants- Mint Green Cardstock, Hearts- Rose Cardstock, Letters- White Cardstock. Once everything is cut, you are going to weave the twine through the holes layering the heart in between pennants. Start by going in from the top and going behind the main stretch of the pennant. Add the letters with the Zots. I tied the ends with some loops, so I could just hang it on the corners of the mantel. 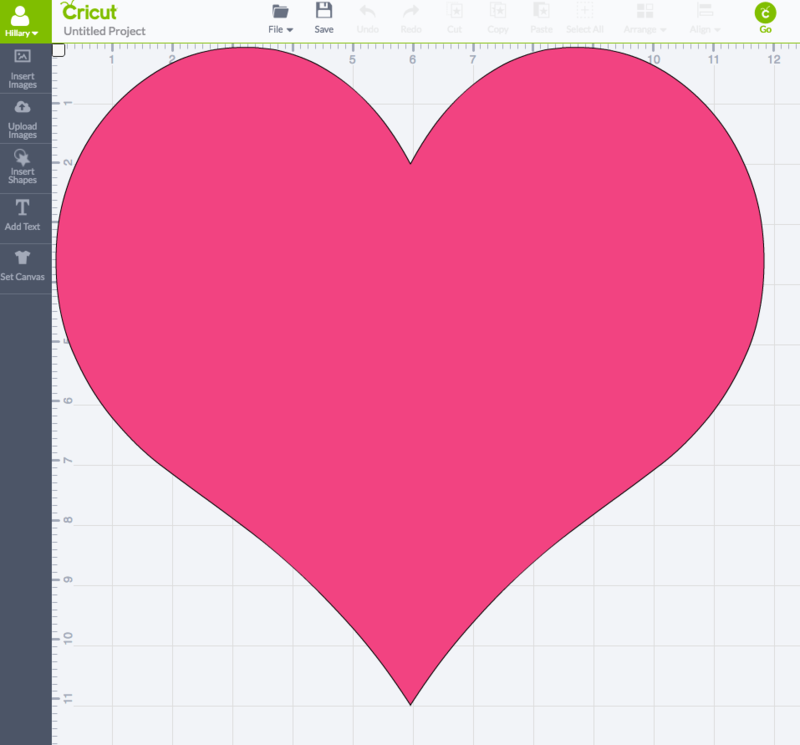 Create a new project add a heart shape of your choice. make it as large as possible for the 12×12 mat. Click go and cut this out of the Cricut Glitter cardstock. Attach it to a wreath with a ribbon. Now for the LOVE tree!! This is such a fun piece of decor to make!! I like to use it for many holidays and just switch out the decorations. You will want to find some old branches. My dad was cutting down a tree so I snagged a few from him. You can always just find some on the side of the road where large trees are. Ribbon and lace. I just rummaged through my fabric stashes and found some. I even used piping tape for the mint color!! Add some Dry floral grass to put in bottom of a jar or vase. You can even get this at the dollar store. Place the branches in the jar and tie them together at the base so they don’t flop all over. Randomly add the lace and ribbon wherever you want. 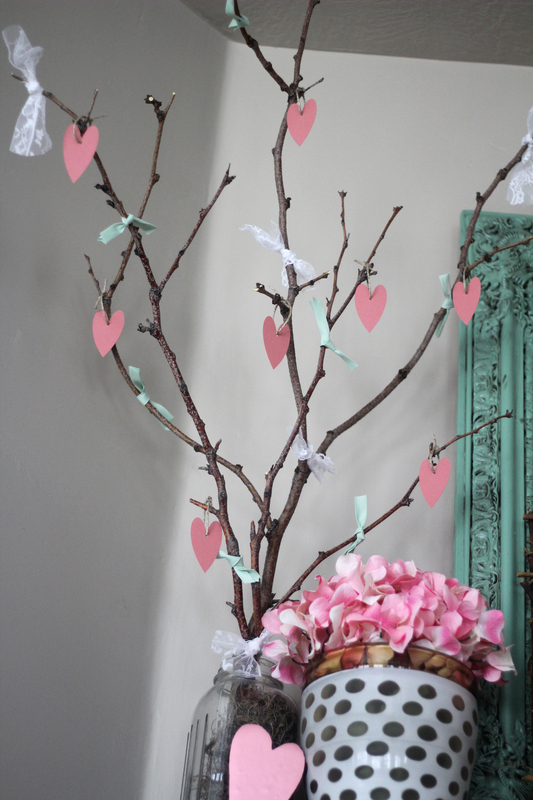 Cut some hearts using the same method as the heart on the banner to create a hole to thread the twine through so you can hang these hearts from the tree. I made 10. Cut those out and make a loop with the twine. Randomly hang the hearts wherever you would like!! How fun is that!!! This is so much fun to do for Halloween also! Use black and white ribbon and then put a crow sitting on one of the branches. The Cricut Explore Air 2 is such an amazing machine and it will allow you to create so many unique DIY projects!! 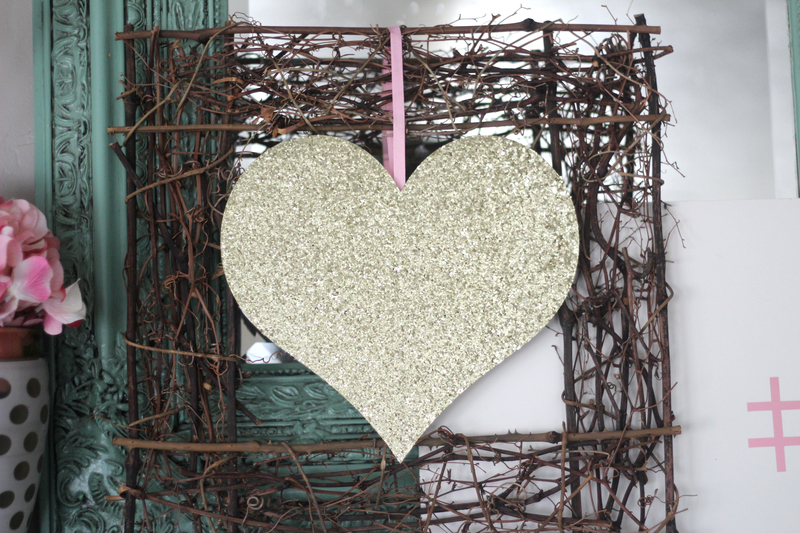 In this project we created a wood sign, holiday banner, gold glitter heart , and a holiday branch tree. The possibilities for DIY projects are endless and you can really make anything you can think of!! For more DIY projects that you can make with the Cricut Explore Air 2 check out my latest post about the Valentine’s shirts for women and children!! You can see that –>HERE . Previous ArticleDIY VALENTINES SHIRTS FOR THE FAMILY WITH CRICUT.